An embarrassment of riches. Thats what youll find between these covers. 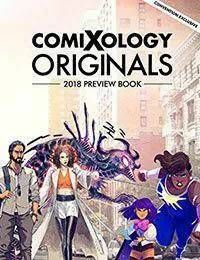 This is what happens when you let creators create — and thats the essence of the 2018 comiXology Originals creator-owned line. This year were debuting at least 11 creator-owned titles from an incredibly diverse group of creators telling very different but equally compelling stories. ComiXology Originals also continues to bring exclusive manga series to readers. Did you know manga creators in Japan, known as mangaka, have a creator-owned tradition? Just turn to page 46 to take a look at some of the great previously unavailable manga we are bringing your way. Our mission at comiXology is to make everyone on the planet a comics, graphic novels, or manga fan. So were making these books free to Amazon Prime members, as well as comiXology Unlimited and Kindle Unlimited members. Inside, youll get a sneak peek at whats coming out this coming year. There is definitely something for everyone.